We’d love your help. Let us know what’s wrong with this preview of Tales of Titans, Vol. 3 by Rich DiSilvio. Tales of Titans, by award-winning author Rich DiSilvio, brings great historical figures to life with concise yet compelling essays, coupled with engaging narratives that enlighten readers to their miraculous deeds, and misdeeds, that have significantly shaped Western civilization. This handsomely illustrated series offers readers brief biographical overviews and cogent ana Tales of Titans, by award-winning author Rich DiSilvio, brings great historical figures to life with concise yet compelling essays, coupled with engaging narratives that enlighten readers to their miraculous deeds, and misdeeds, that have significantly shaped Western civilization. Even those less inclined to read history will be drawn into DiSilvio's rich narratives that read like novelettes. Yet these engaging tales are constructed from actual events and are infused with original quotes that prove to be both humanizing and instructional. Meanwhile the essays offer unique factoids and perspectives that broaden understanding. To ask other readers questions about Tales of Titans, Vol. 3, please sign up. New York author Rich DiSilvio, a man as committed to music, art, philosophy and sociology as informed by the fine arts, takes periods of history with all of the fascinating changes, discoveries, triumphs and failures and by introducing some fictional enhancements within the stage setting of this era makes it far more credible. We see so much better through the eyes of witnesses than through the most sophisticated lenses of modern technology. And in DiSilvio's handling of the parallel or concurrent unraveling of historical events with those of the textbook rigidity of his main Titans he provides not only keen insight but also pauses for the inclusion of the arts, so often ignored by other historical novel writers. At this point Rich has taken us from Rome and the Renaissance through to the atomic age in his Volumes 1 and 2. Now he concentrates on the giants of the founding fathers of the USA through to the era of WW II – and a bounty of information there is. Rich cultural development details of a young country blossoming onto the global stage into WW II make for satisfying learning as well as abundant entertainment. While some readers may pause because of the plethora of stories about WW II and the extremes of the Nazis, this reader would hastily add ‘but you haven’t thought about it the way Rich has’. His story is unique in that it relives a period of time and then brings it back in to the future like a ghost story – a very clever and successful choice for creating a fascinating new novel. Rich opens his book with a Prelude that offers a more factual picture of how America came to be ‘discovered’ and developed that the usual Pilgrim/Columbus version usually skirts – or at least makes less personal and interesting. He, of course, has added art in the manner of paintings and photographs to bring a sense of immediacy to his unwinding the lives of Samuel Adams, Thomas Paine, George Washington, John Adams, Thomas Jefferson, James Madison, Alexander Hamilton, Ben Franklin, and adds the contributions of lesser known titans as Sybil Ludington, James Armistead Lafayette, Elizabeth Cady Stanton, Susan B. Anthony, Harriet Tubman, Frederick Douglas and more before heading into the description of Hitler’s heinous rise, with concurrent information about Winston Churchill and Franklin Delano Roosevelt. It is staggering in both fact and in the rich colors with which Rich DiSilvio has painted this panorama. Rich’s style is compelling, jolting in the manner in which he lays open old wounds of our making we had hoped would somehow heal without medicaments, and at the same time infuses a gentle tenderness in his depiction of `common man'. This is a magnificent epic novel, one that will be always with us - and hopefully in the classrooms of students who so desperately need to understand our true history. In honor of Riche’s writing he closes his book with an aura - ‘Yet despite each nation's respective fall and rise, the fight to eliminate Hitler’s brutal Third Reich had been victorious. The darkness of Hitler’s bloody regime, born in the bowels of Hell and dedicated to hatred, was expunged, as the light of a new dawn shed its rays on a grateful free world. Integrity had conquered hatred.’Let us all hope that our current national and global chaos will have a similar reprieve. Rich DiSilvio is himself a Titan by any definition. Writing History proclaims a person’s true self. Rich DiSilvio reveals his love of true heroes of our past by honoring them with his respectful words. These enticing essays highlighted their lives, but Rich didn’t attempt to cover up their controversial character. One of my favorite essays was about Susan Anthony and, of course, her good friend Elizabeth Stanton. Together they made a larger impact than each of them could on their own. “It had been said that Elizabeth forged the thunderbolts and Su Writing History proclaims a person’s true self. Rich DiSilvio reveals his love of true heroes of our past by honoring them with his respectful words. These enticing essays highlighted their lives, but Rich didn’t attempt to cover up their controversial character. One of my favorite essays was about Susan Anthony and, of course, her good friend Elizabeth Stanton. Together they made a larger impact than each of them could on their own. “It had been said that Elizabeth forged the thunderbolts and Susan fired them.” She had been criticized by many because she never married, but her response was, “A woman who will not be ruled must live without marriage.” At her death men and women of every kind admired her earnest and unselfish life. Sybil’s Ludington’s Midnight Ride was well written about the courageous trip Sybil took to warn villages that the troops were needed to assist her father against the British. It was interesting the two things her father taught her that prevented her horse from being stolen: how to use a good stick and never dismount your horse for a stranger. History has always fascinated me and so Tales of Titan proved to be a great read. The good thing about this book is that it is presented in an interesting manner where the heroes are shown with their warts and beauty spots. Usually most of the history books just focus on the bright side of the world heroes, but Rich DiSilvio presented the heroes in a realistic manner and showed their progress to success which was often circumstantial rather that work of great thinking. For example I came to know History has always fascinated me and so Tales of Titan proved to be a great read. The good thing about this book is that it is presented in an interesting manner where the heroes are shown with their warts and beauty spots. Usually most of the history books just focus on the bright side of the world heroes, but Rich DiSilvio presented the heroes in a realistic manner and showed their progress to success which was often circumstantial rather that work of great thinking. For example I came to know that George Washington initially rose to prominence not due to any positive quality but because of death of close relatives and his appealing personality. In fact, the book shed many such secrets which are either absent or changed in the official biographies of the heroes. Hence, the book is a commendable read and I applaud the author for undertaking such thorough research and doing a great job in writing essays about the Titans. One of the regrets of my grammar school days is my lack of interest in history. This was mostly my own fault as too many things, such as my baseball card collection, were much higher priorities. However, I won’t lay all the blame on myself, as the assigned history textbooks did nothing to inspire interest, let alone capture my imagination. I read the assignments and memorized the places and dates needed to past the tests, but it was all short-term memory that evaporated from my mind once it was One of the regrets of my grammar school days is my lack of interest in history. This was mostly my own fault as too many things, such as my baseball card collection, were much higher priorities. However, I won’t lay all the blame on myself, as the assigned history textbooks did nothing to inspire interest, let alone capture my imagination. I read the assignments and memorized the places and dates needed to past the tests, but it was all short-term memory that evaporated from my mind once it was no longer needed for my report card. Tales of Titans is not a textbook, but it succeeds where so many textbooks fail. It engages the reader. Regardless of your proximity to the cradle or the grave, there is much to be learned and enjoyed within these pages. If only my grammar school textbooks had taken the same approach to history as Tales of Titans. The first half of Volume 3 focuses on some of America’s “Founding Fathers”. These are all names drilled into our heads enough times as school children that they are recognizable, if in name only. Tales of Titans shows that these names belonged to real people; destined for greatness, yes, but fallible just like the rest of us. Presenting these men as human beings instead of mere factoids related to certain dates and battles is what allows Tales of Titans to rise above being just another history book. Alexander Hamilton’s moral double standard between public and private life. George Washington’s aristocratic influence lending to initially unmerited military rank and battlefield defeat. These are the foibles of real people, and it puts their influence upon historic documents or command of decisive military battles in a new, more appreciated, perspective. From there Tales of Titans tells the stories of two lesser known heroes of the Revolutionary War, Sybil Ludington and James Armistead Lafayette. These show how a teenage girl and an African-American slave played key roles in the war effort. Tales of Titans is a short book, so the remaining stories cut a wide swath of (mostly) American history. We learn of Elizabeth Cady Stanton, Susan B. Anthony, and Harriet Tubman; all key names in the Women’s Suffrage and Abolitionist movements. Growing up, any mention of Susan B. Anthony only brought up images of the diminutive silver dollar coin that garnered 5 games of pinball instead of 4 at our local arcade. Any mention of the others would have been serenaded with chirping crickets. The final tales are of Adolph Hitler, Franklin D. Roosevelt, and Winston Churchill. These are told in first-person accounts as these men discuss real events surrounding World War 2. We are offered a fictional dialogue between Hitler and an old boyhood friend as Hitler illuminates his hateful ideology. A similar fictional dialogue between Roosevelt and Churchill concludes Tales of Titans as they discuss how to halt the Nazi oppression. 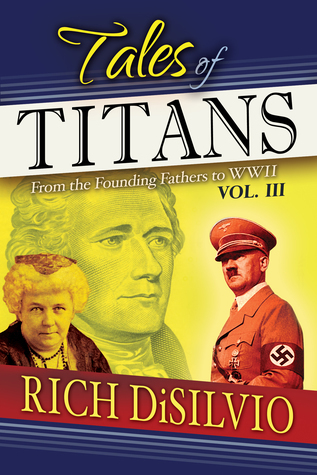 Tales of Titans Volume 3 by Rich DiSilvio is a sort of anthology of short biographies of famous people throughout history along with some fictionalized interactions with them. The biographies are short, but they are packed with lots of information on the different individuals featured in the book. The interactions with the people are also interesting and they play off of the facts that are presented in the biographies. The style of writing is excellent for this type of work because it is simple Tales of Titans Volume 3 by Rich DiSilvio is a sort of anthology of short biographies of famous people throughout history along with some fictionalized interactions with them. The biographies are short, but they are packed with lots of information on the different individuals featured in the book. The interactions with the people are also interesting and they play off of the facts that are presented in the biographies. The style of writing is excellent for this type of work because it is simple yet descriptive and keeps the reader focused on the individual without ever becoming boring and overbearing. Fantastic read! You won’t find history/biography books like this anywhere. DiSilvio has a technique like no other. In this volume DiSilvio gives us nice overviews of the Founding Fathers, spending more time with some than others. I found the Paine, Washington, and Hamilton chapters in particular very informative, revealing info I wasn’t aware of and appreciating the author’s ability to create vivid and memorable analogies, like those he presented between Hamilton and Jefferson. The narrative sc Fantastic read! You won’t find history/biography books like this anywhere. DiSilvio has a technique like no other. The narrative scene with Sybil Ludngton is exceptional, clearly the best account of this midnight ride available. Then engaging stories of women suffragettes and Harriet Tubman follow, which reveal eye-opening info that make you cringe at the abuses and struggles they had to overcome, yet also instills even greater admiration for these women whose stories have for too long been marginalized or ignored. Well done. Adolf Hitler follows, which is a fantastic narrative that really brings this notorious character to life, from his teen years up to when he seizes power. These scenes are truly disturbing yet very impactful. The Nazi leader’s ugly hatred is brought into sharp focus, making us realize why the Final Solution would materialize. Tales of Titans, vol. 3, is another example of DiSilvio’s exemplary writing style and fervent desire to offer appetizing vignettes of important historical figures within the context of taking the reader on a trip into the era being written about. His deliberate style is both comforting and logical as stories and facts are woven together in order to give the reader an entertaining adventure. In this volume, which is a short, easy 3-hour read, figures covered range from Samuel Adams to FDR and Chur Tales of Titans, vol. 3, is another example of DiSilvio’s exemplary writing style and fervent desire to offer appetizing vignettes of important historical figures within the context of taking the reader on a trip into the era being written about. His deliberate style is both comforting and logical as stories and facts are woven together in order to give the reader an entertaining adventure. In this volume, which is a short, easy 3-hour read, figures covered range from Samuel Adams to FDR and Churchill, with George Washington, Harriet Tubman and many others included. What strikes me most about DiSilvio’s writing is his efficient style. Face it, reading historical accounts can be dreadfully boring but he captivates the reader with rich content without the superfluous fluff found elsewhere while keeping the historical record accurate. I heartily recommend this book and the others that he has written. Tales of Titans focuses on three separate areas, the founding fathers of America, Women fighting for equal rights in the USA and a brief look at Hitler’s rise to fame. The author’s voice is well rounded and flows well with the odd hint of well-placed humour makes for easy reading. The majority of the book focuses on the founding fathers of the USA which was incredibly well written and researched, and as a Brit who had little knowledge of these key founders, I found it easy to follow along and ma Tales of Titans focuses on three separate areas, the founding fathers of America, Women fighting for equal rights in the USA and a brief look at Hitler’s rise to fame. The author’s voice is well rounded and flows well with the odd hint of well-placed humour makes for easy reading. The majority of the book focuses on the founding fathers of the USA which was incredibly well written and researched, and as a Brit who had little knowledge of these key founders, I found it easy to follow along and make sense of everything. Moving on the women warriors as it is coined in the book, this section is once again incredibly well written, with some dramatized ‘fictional’ (I say fictional in commas as they were based off real life events but no-one was quite sure what exactly happened) stories that help portray what these women went through. My only gripe here is that it was relatively short, and I would have liked a bit more depth. Finally the book moves onto Hitler and the chapter focuses on a fictional conversation with his old flatmate. Although an interesting scene, the fact that it wasn’t fact and a lot of assumptions were made to create it took away from it. Also, it was also a fairly short section and compared to the other two, I don’t think justice was entirely done. Overall, Tales of Titans is a great book, giving detailed historical facts along with engaging (slightly fictional) tales from those times. Its strongest section is that of the founding fathers of America, which is excellently written and was a pleasure to read. Tales of Titans, Vol. 3: Founding Fathers, Women Warriors & WWII is a detailed, well-written exploration of a number of major historical figures including Harriet Tubman, John Adams, and Thomas Paine. The profile of each historical figure is explored in layman’s terms; Tales of Titans is less a history textbook and more an overview for those who might not otherwise explore history books. In this way the history it portrays becomes very digestible, and the characters it highlights become unde Tales of Titans, Vol. 3: Founding Fathers, Women Warriors & WWII is a detailed, well-written exploration of a number of major historical figures including Harriet Tubman, John Adams, and Thomas Paine. The profile of each historical figure is explored in layman’s terms; Tales of Titans is less a history textbook and more an overview for those who might not otherwise explore history books. In this way the history it portrays becomes very digestible, and the characters it highlights become understandable and sympathetic. I give special praise to the attention paid to misconceptions about the religious backgrounds of many of the founding fathers, which many more casually-styled books on history avoid. The final third (approximately) of the book introduced a somewhat jarring change; gone were the clean overviews of the lives of historical figures. In their place came historical fiction, complete with dialogue by fictionalized versions of historical figures like Adolf Hitler and Franklin Delano Roosevelt. While the historical fiction in-and-of-itself was not badly written by any means, it clashed stylistically with the previous overviews in a way that could surprise many readers. Nonetheless, Tales of Titans is an enjoyable and competent layman’s history of the United States from the Revolutionary War to the Second World War. Who SAYS "History Classes Has To be BORING"
In this 190 pages of compelling narratives, Rich Di Silvio's historical writings are exciting and historically sound. The Tales of Titans Volume 3 is a breath of fresh air. It is riveting entertaining and incredible historical facts are entwined in the pages of this beautiful book. The biographical accounts are savory and breathtaking. There is always an abundance of information within the pages of Rich's books. Where were you when I took History Classe Who SAYS "History Classes Has To be BORING"
Where were you when I took History Classes? I enjoyed the simplicity to which all accounts were recorded, yet the astounding layout of events draws the reader in. I believe the art of assimilating a storyline with History made this book quite enjoyable. Memories flooded my mind about the last Rich Di Silvio's historical book and short stories I read. I think I'm becoming slowly addicted to Historical Biographies. This is Volume 3 in the Tales of Titans series by Rich DiSilvio. This volume takes a look at people like the founding fathers, courageous women, and notable people from World War II. You’ll be able to learn more about historical figures like Samuel Adams, Alexander Hamilton, Harriet Tubman, and Winston Churchill with this book. DiSilvio’s writing style makes reading about these historical figures very interesting and uses narratives to help bring up facts about them that many are unaware of. He a This is Volume 3 in the Tales of Titans series by Rich DiSilvio. This volume takes a look at people like the founding fathers, courageous women, and notable people from World War II. You’ll be able to learn more about historical figures like Samuel Adams, Alexander Hamilton, Harriet Tubman, and Winston Churchill with this book. DiSilvio’s writing style makes reading about these historical figures very interesting and uses narratives to help bring up facts about them that many are unaware of. He also includes interesting quirks of their personalities so you can get a better idea of who they were as a person. Additionally, you’ll find pictures of these historical figures to help you better understand more about them. Tales of Titans, Vol. 3: Founding Fathers, Women Warriors and WWII is the third book in Rich DiSilvios Tales of Titans series. I have to admit it was the women warriors part that caught my attention and drew me in. I love reading about strong women who made an impact on our present by being a force to be reckoned with in the past! I was a bit disappointed that Harriet Tubman and Susan B Anthony didn’t get the big bold introduction as the founding fathers and even Hitler did. Interesting history! Tales of Titans volume 3 is a fantastic continuation of DiSilvio's work, though it does stand apart on its own as a fantastic read if you haven't read his work before. The writing speed is quick and sometimes frantic, bringing you into the stories very quickly and holding you there. It is like you knew these people. This is completely different from a history course or a history book. You get an entertaining story, some adventure, and you'll learn a little bit in the process. It will likely take Tales of Titans volume 3 is a fantastic continuation of DiSilvio's work, though it does stand apart on its own as a fantastic read if you haven't read his work before. The writing speed is quick and sometimes frantic, bringing you into the stories very quickly and holding you there. It is like you knew these people. This is completely different from a history course or a history book. You get an entertaining story, some adventure, and you'll learn a little bit in the process. Tales of Titans is an admittedly interesting read which provides me with a rich historical background on a place I wish to go to one day. Most of the book contains very familiar names that have more information than the usual short paragraph descriptions in textbooks at school and provides an in-depth history on the heroic deeds, adventures and political ventures of notable historic figures, as well as few details.on their daily lives and how these figures helped their country grow and come to b Tales of Titans is an admittedly interesting read which provides me with a rich historical background on a place I wish to go to one day. Most of the book contains very familiar names that have more information than the usual short paragraph descriptions in textbooks at school and provides an in-depth history on the heroic deeds, adventures and political ventures of notable historic figures, as well as few details.on their daily lives and how these figures helped their country grow and come to be successful in their time. A very informative and educational read, Tales of Titans does justify its own titles as its contents are noteworthy, interesting and gives the reader an insight as to how a country rose to power and success with the intellect and strategies of a few people. When I was in school I always had a hard time being interested in history. I don’t honestly remember a lot of what I learned either. I know that DiSilvo writes historical fiction but the way that he tells his stories really captivates me and I find them to be very interesting. In Tales & Titans Vol 3, he covers a range of people and includes quotes as well as a bio of sorts for them so now I truly have some more historical knowledge which I think is a good thing. We are doomed to repeat hist When I was in school I always had a hard time being interested in history. I don’t honestly remember a lot of what I learned either. I know that DiSilvo writes historical fiction but the way that he tells his stories really captivates me and I find them to be very interesting. In Tales & Titans Vol 3, he covers a range of people and includes quotes as well as a bio of sorts for them so now I truly have some more historical knowledge which I think is a good thing. We are doomed to repeat history but trying to sweep what happened in the past under the rug. “Tales of Titans, Vol. 3: Founding Fathers, Women Warriors, & WWII,” is Rich DiSilvio’s continuing novel that does a great job going over all of the historical aspects that riddle earth’s history. It is quite impressive how Disilvio is able to write these narratives from so many different perspectives and be historically accurate. You get to experience influential members of society (the good and the bad) and everything they offered and did to society, which is just very fascinating. If you love history, this is a great book to read and while there are multiple within this set, you don’t have to have read other books from DiSilvio’s to know how this book works. He incorporates truly real quotes and experiences that these historical figures were known for while simultaneously spinning them into a tangible person compared to someone you just read a few facts about in a history book. From this novel I can see why Rich DiSilvio is an award-winning author. I have not read any of his other novels, but if they are anything like Founding Fathers, Women Warriors and WWII, this author is up there with the bests. Although this is the third book in the series, you can read it on its own and fully grasp the layout and concept of this narrative. It is not like a follow up from the previous novel. In this novel, DiSilvio brings great historical figures to life. It features Samuel Adams, From this novel I can see why Rich DiSilvio is an award-winning author. I have not read any of his other novels, but if they are anything like Founding Fathers, Women Warriors and WWII, this author is up there with the bests. In this novel, DiSilvio brings great historical figures to life. It features Samuel Adams, George Washington, John Adams, Thomas Jefferson, and Ben Franklin just to name a few. It is historical, with known facts and real life quotes, and some very nice art. However, it doesn’t take you back to the days of boring history classes. It heightens the experience by first making the read very concise. Second, It brings in fictional scenarios into the narrative to help to add life and realism to the biographies. Through his exemplary writing style, he manages to bring together the good, the bad and the ugly; nothing in hidden in the life of these Titans.